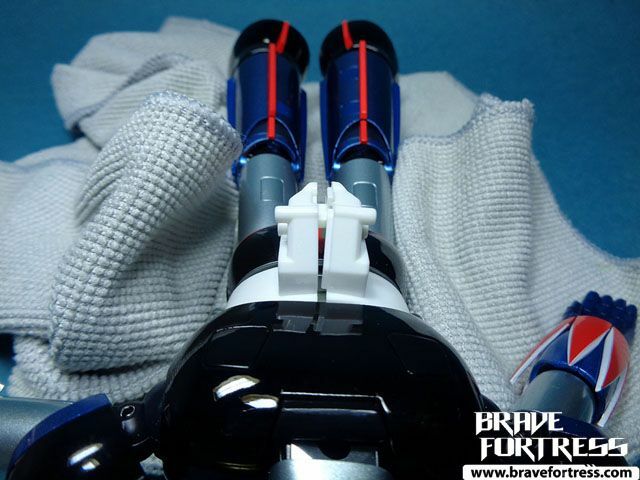 Extra hands and torso cover are hidden inside the display base. 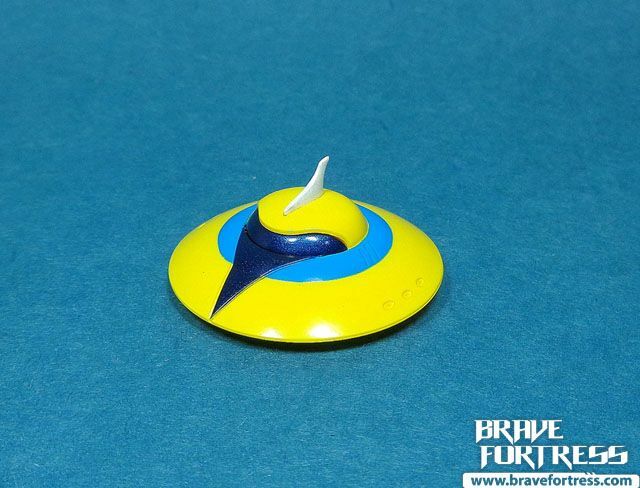 Impressive pearl paint finish on the Spazer. 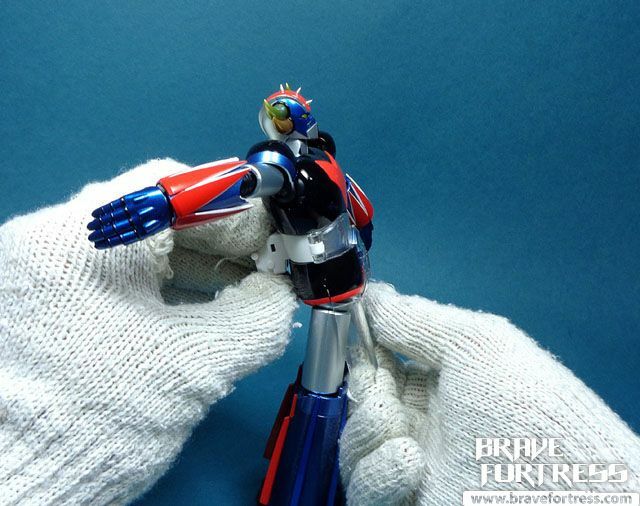 Attaching the wings aren’t that hard. 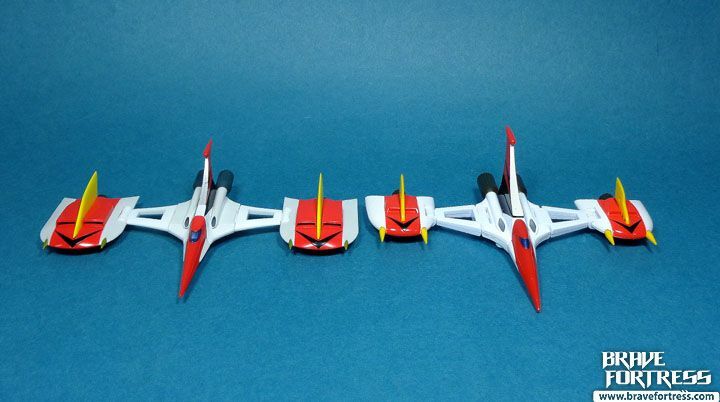 It’s easier than how the SRC Spazer wings had to be attached. 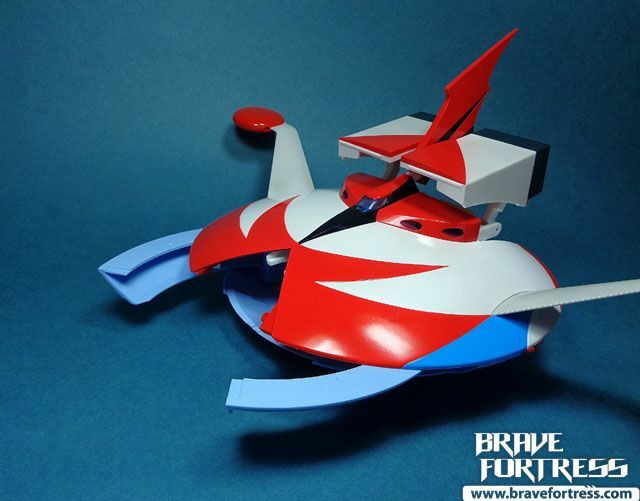 Getting the Grendizer into the Spazer requires opening up a LOT of panels and hatches. 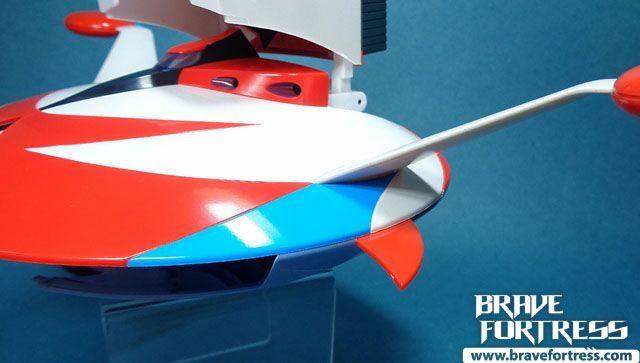 When sliding the front blue panels to the back, make sure you flip out these fins out first, as they will cause resistance when you push the blue panels backwards. 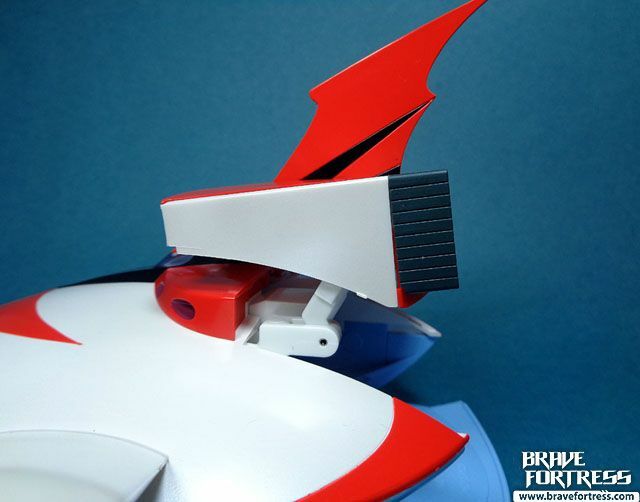 You’re supposed to flip these red fins out anyways since that’s what happens in the Anime when Grendizer docks with the Spazers (the red fins sprout out of the Spazer). 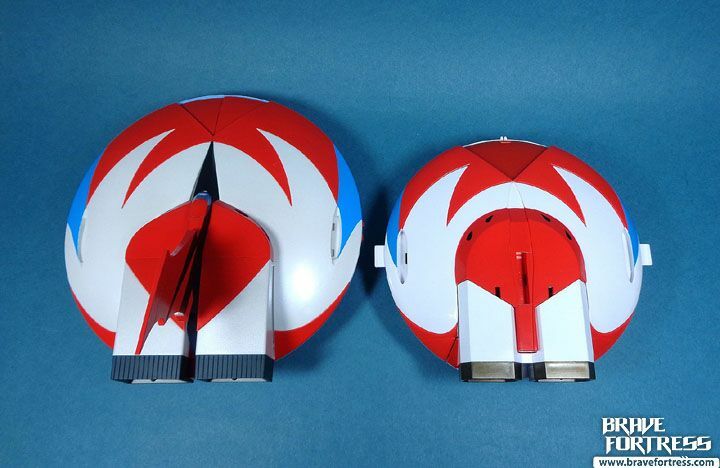 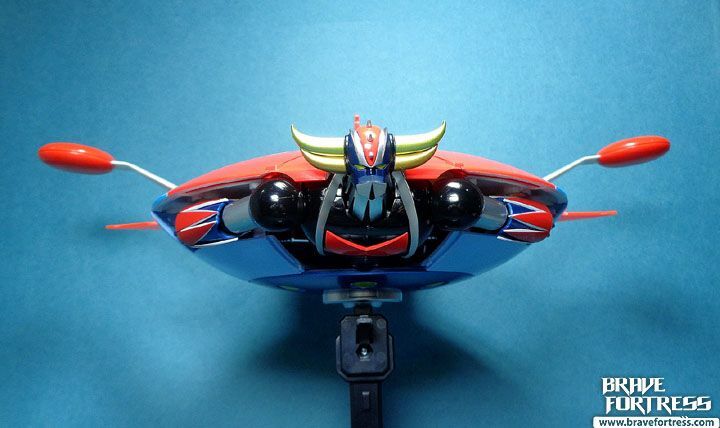 The torso protector (right side, the one with painted parts) prevents sliding and paint scrapping of Grendizer while inside the Spazer. 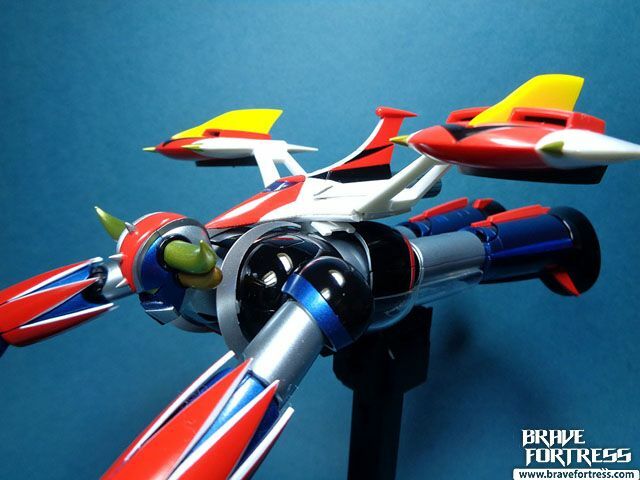 It also provides a rail system of sorts so you can easily “eject” Grendizer out without incident. 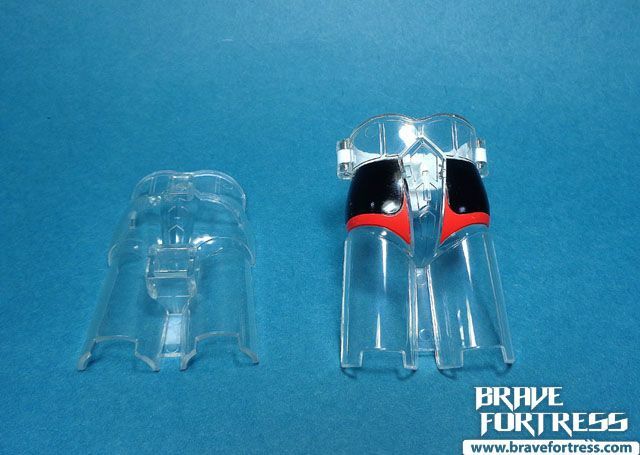 To remove the torso protector, this is what the split half should look like, the tab should be on Grendizer’s left side. 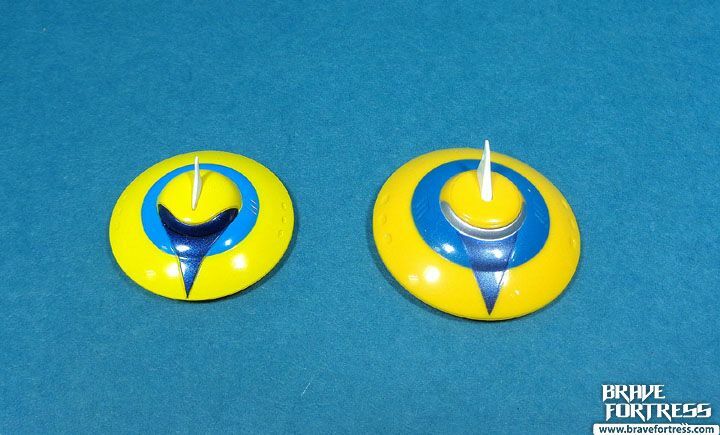 It’s hard to push the halves open even when using the tab. 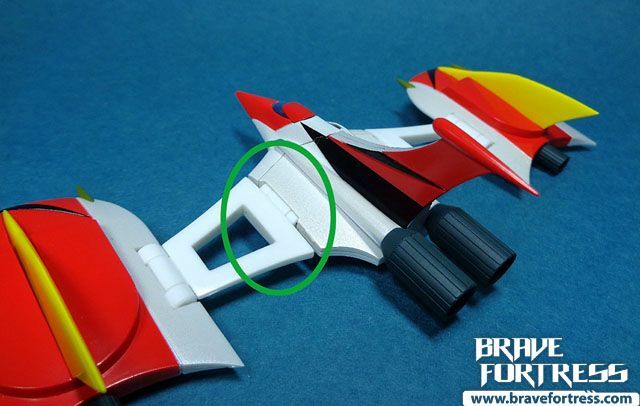 Alternately, you can also pry the connection loose by lifting the thigh parts upwards until the connection in the back splits open. 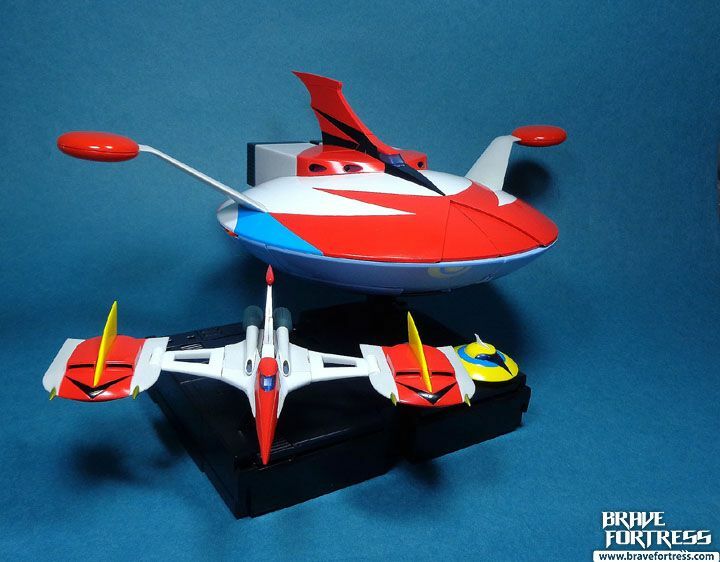 It’s faster to do this but I don’t really recommend doing this often as it’s still clear plastic that you’re exerting force on. 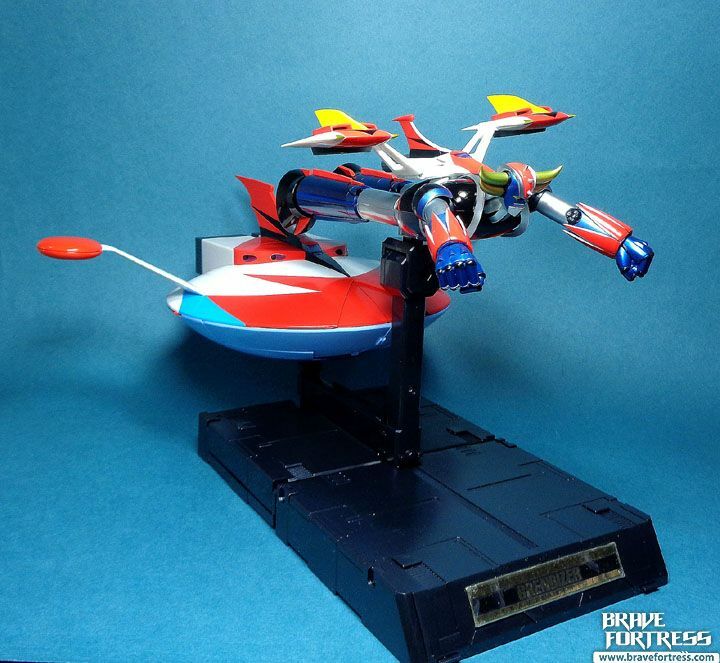 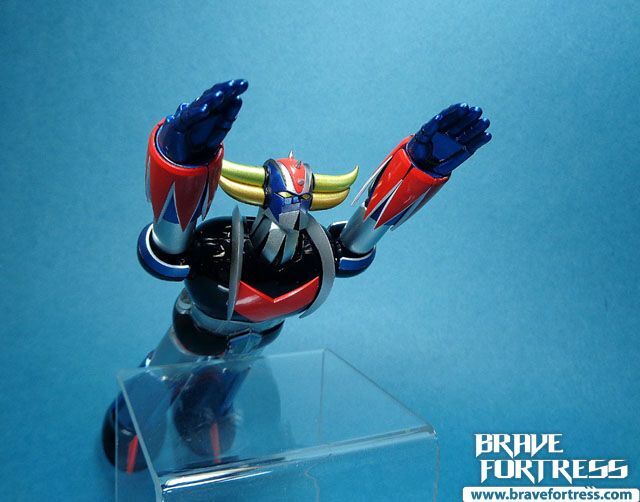 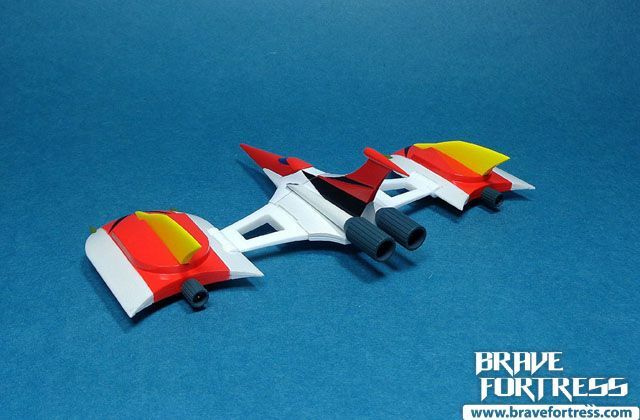 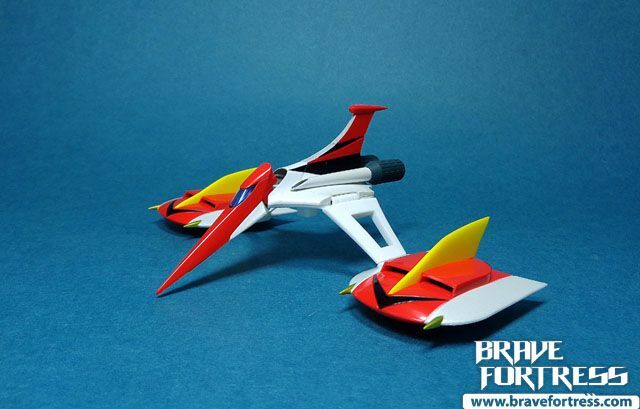 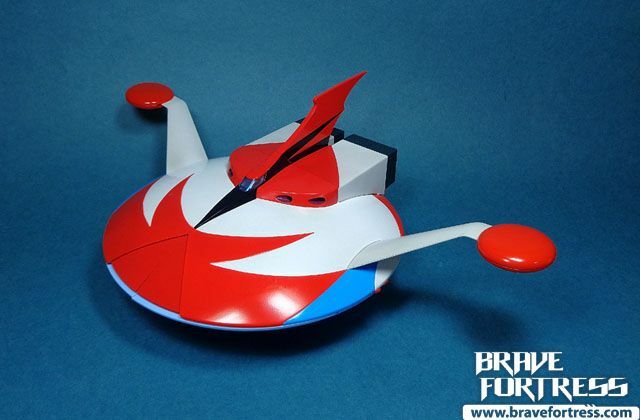 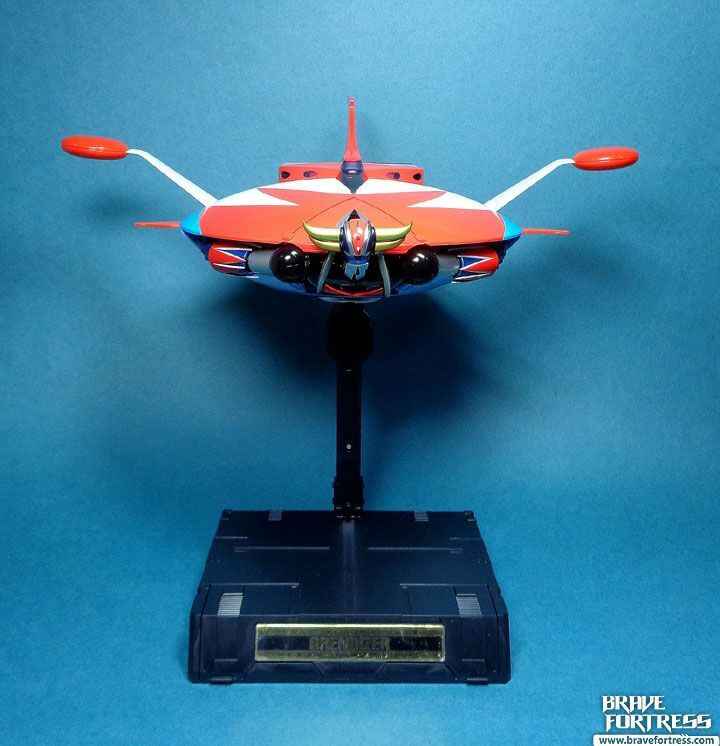 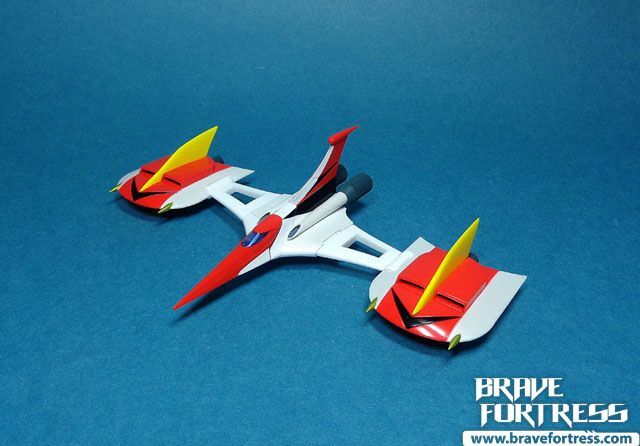 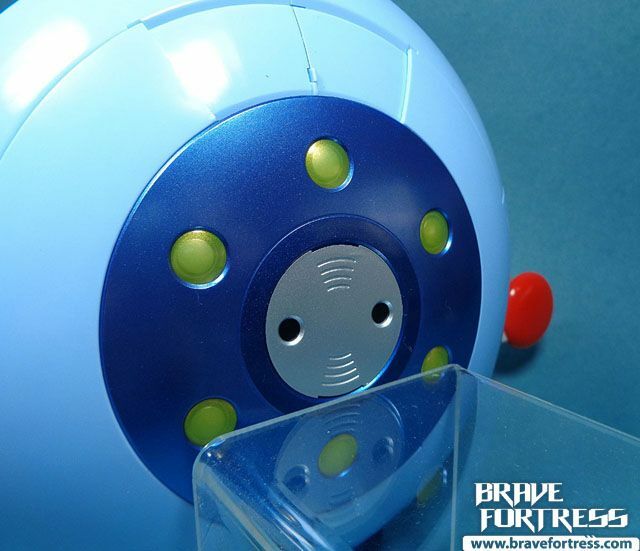 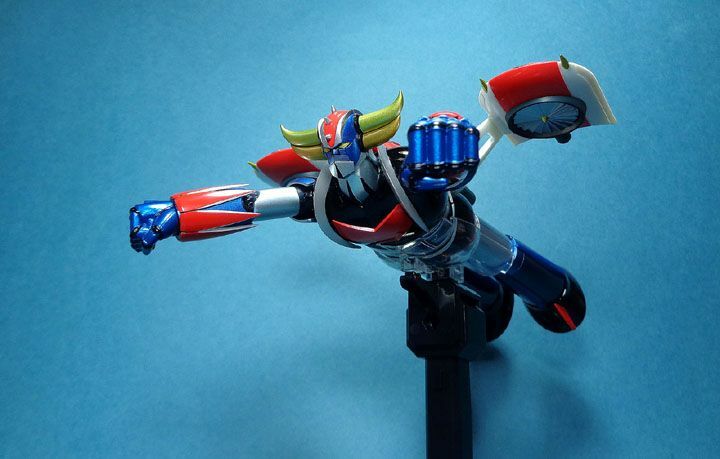 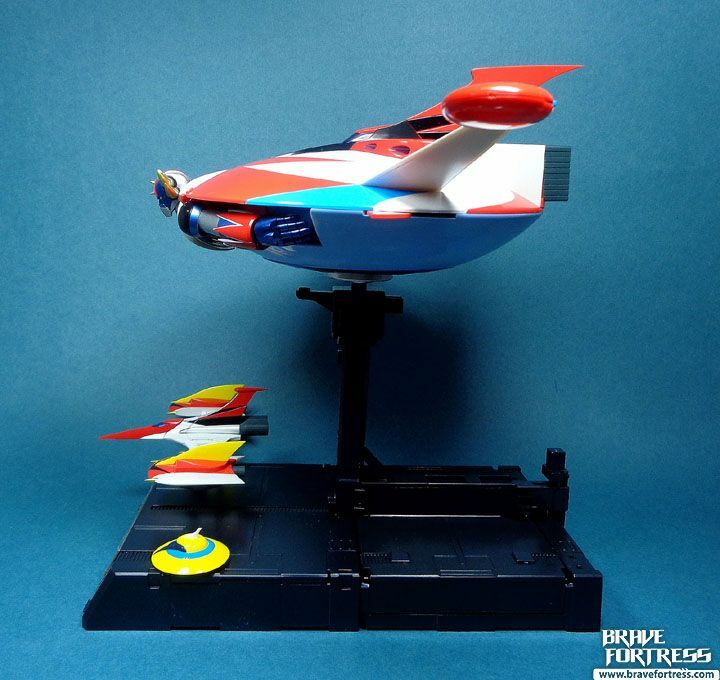 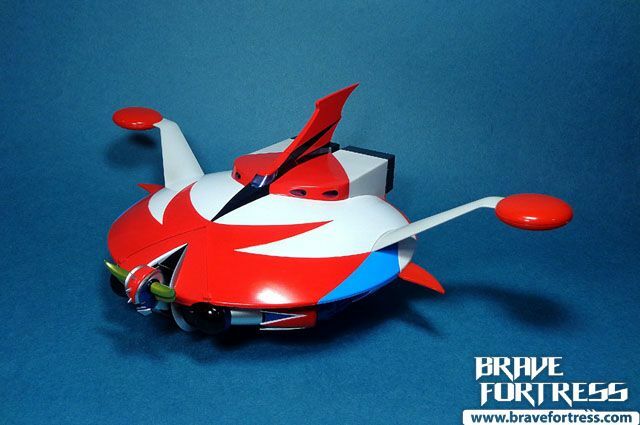 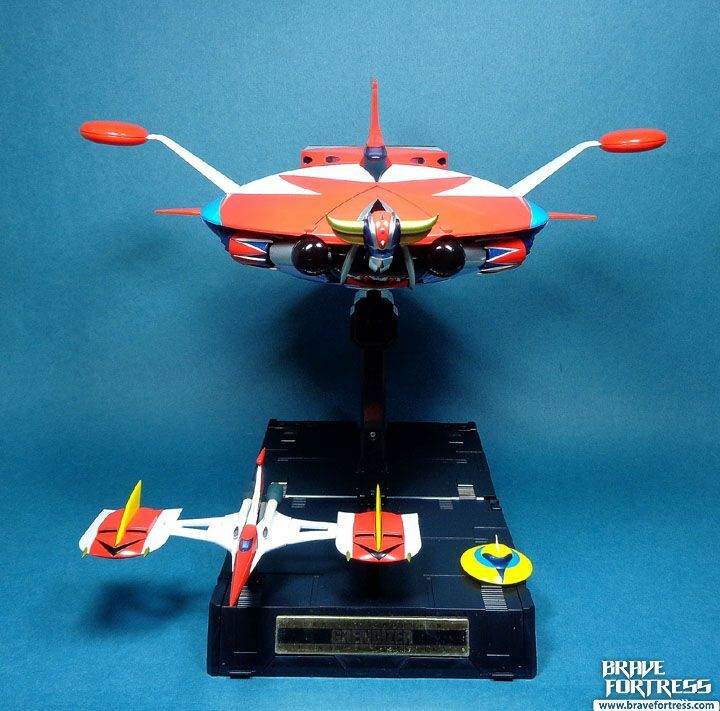 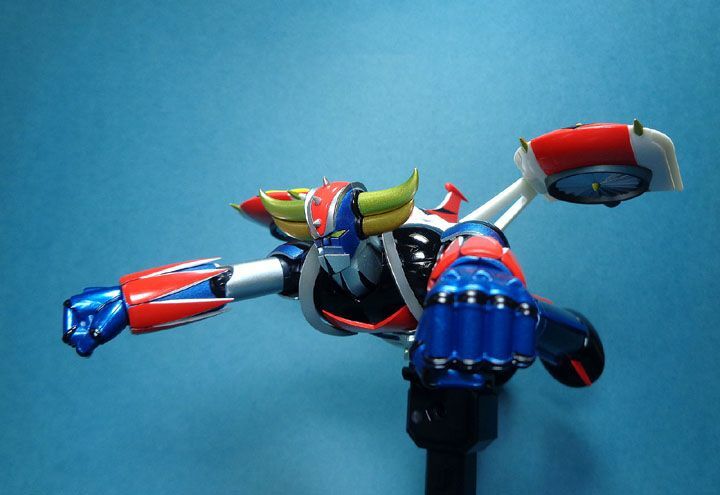 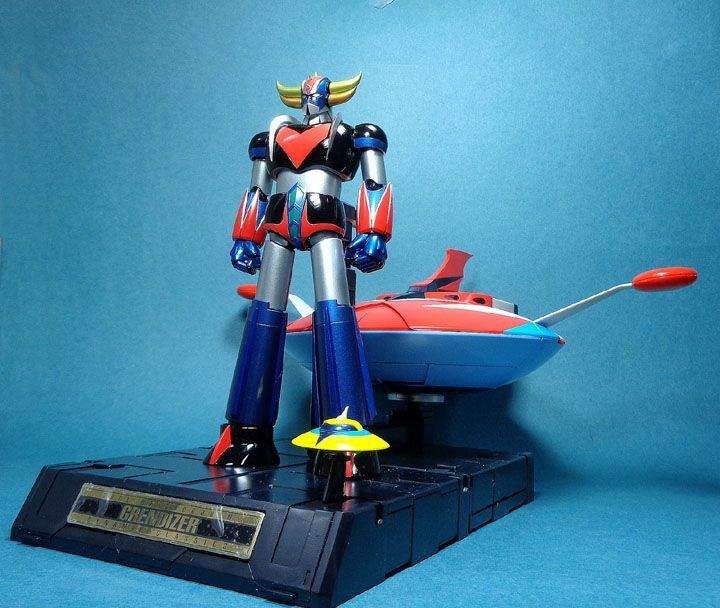 For a while, there was some doubt as to whether Bandai would actually release the Spazer for the D.C. Grendizer as the sample model was teased for some time at various Tamashii events before Bandai officially announced a release date. 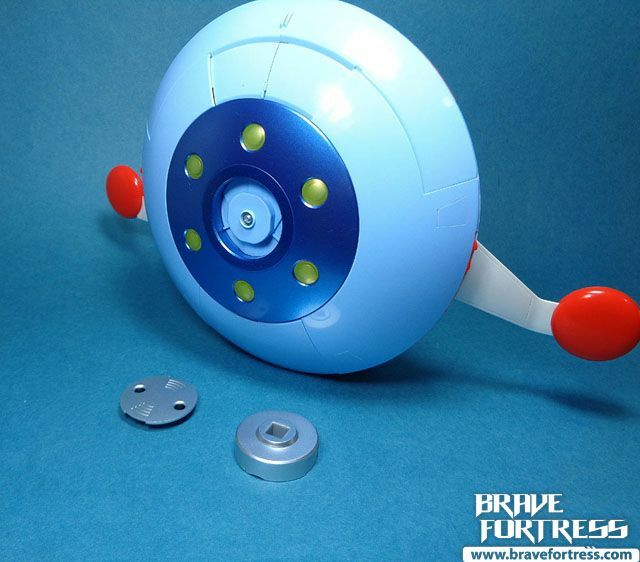 Some parts swapping is required when it comes to getting the saucers weaponized. 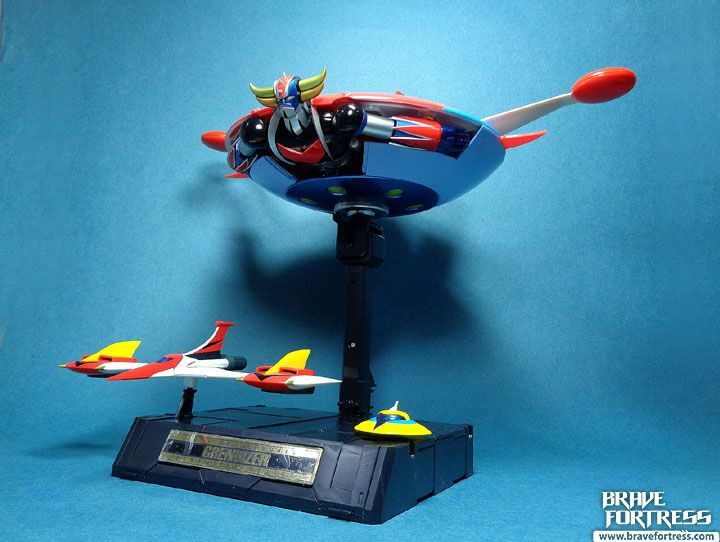 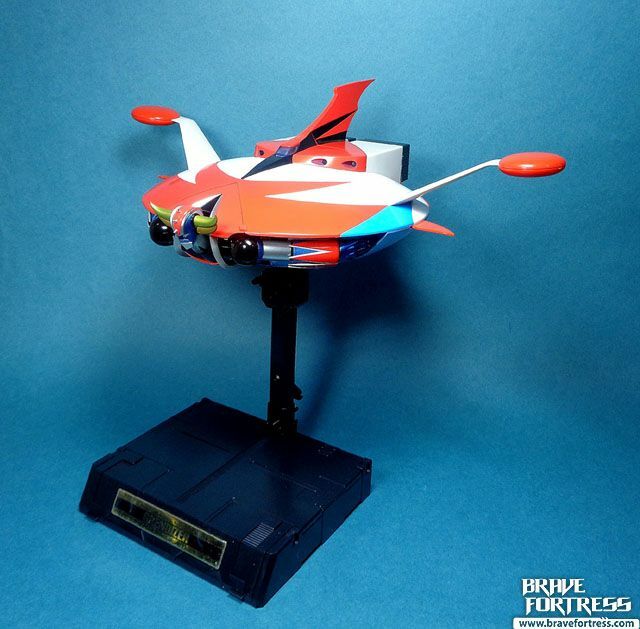 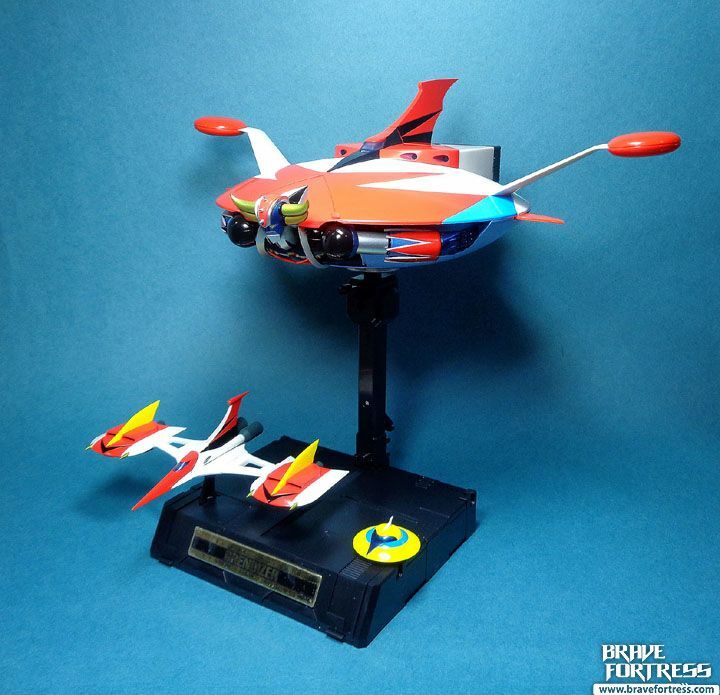 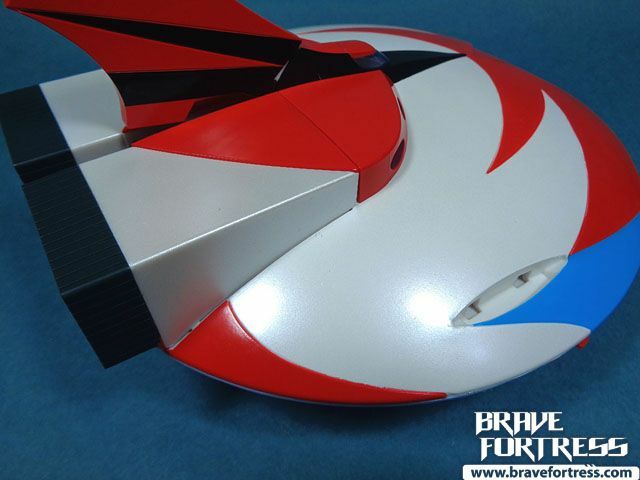 Koji Kabuto’s TFO (Terrestrial Flying Object). 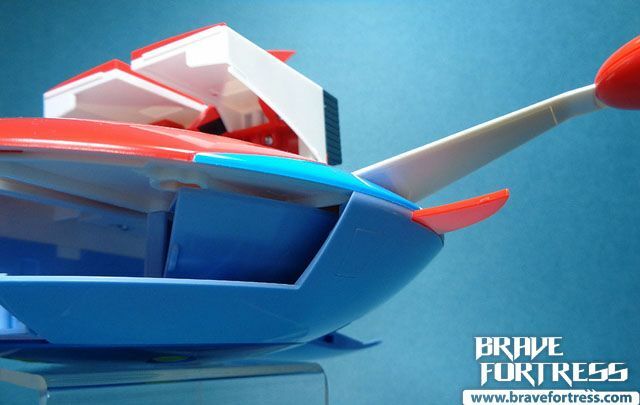 The TFO is entirely plastic, sadly. 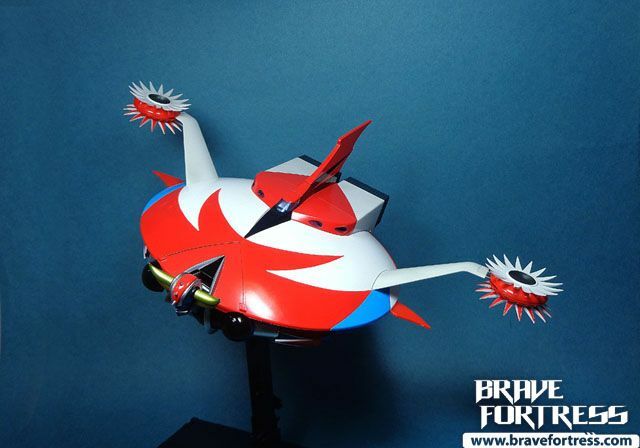 Koji got shot down so many times in the TFO, then he upgraded to the JFO (Japanese Flying Object) a triangular ship that still got shot down a lot again in the manga (it also appeared in the Anime in episode 30), before he finally upgraded to the Double Spazer so he could fight better against the Vegans. 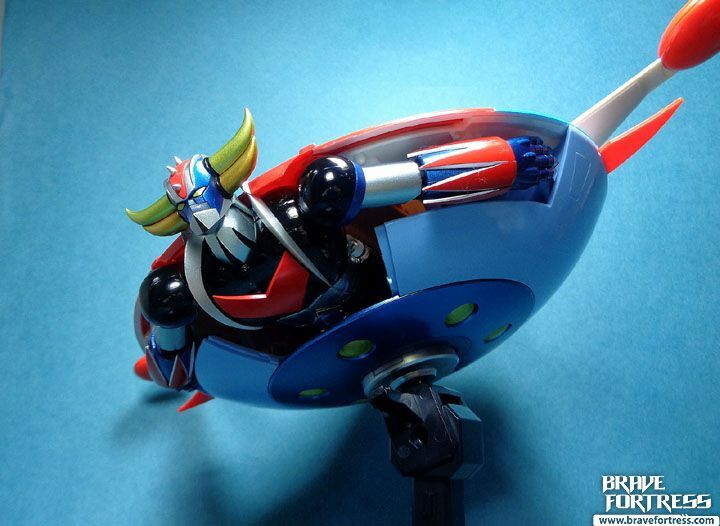 As to why he didn’t just go get Mazinger Z instead is just pure insanity. 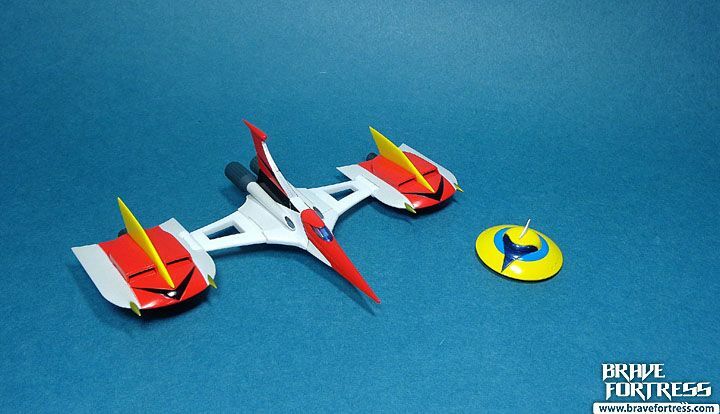 The Double Spazer is powered by a Photonic Energy reactor and can travel at a max speed of Mach 4 (the Spazer can go up to Mach 9). 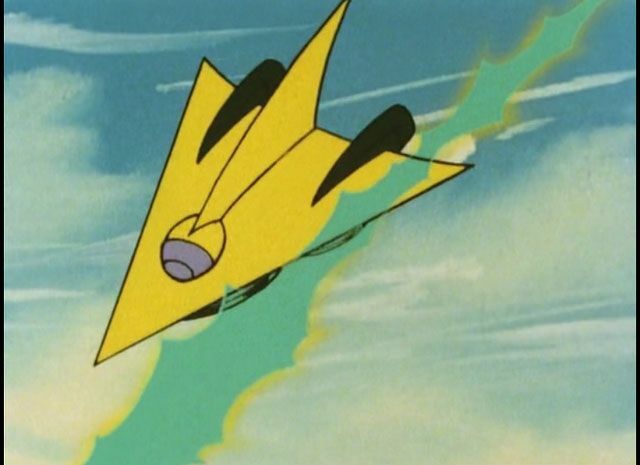 The vehicle first appeared in episode 35. 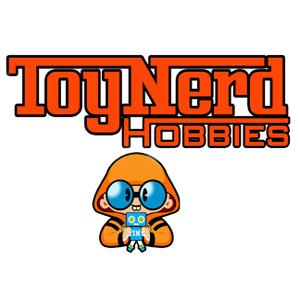 First time combining (in dramatic fashion) in episode 36. 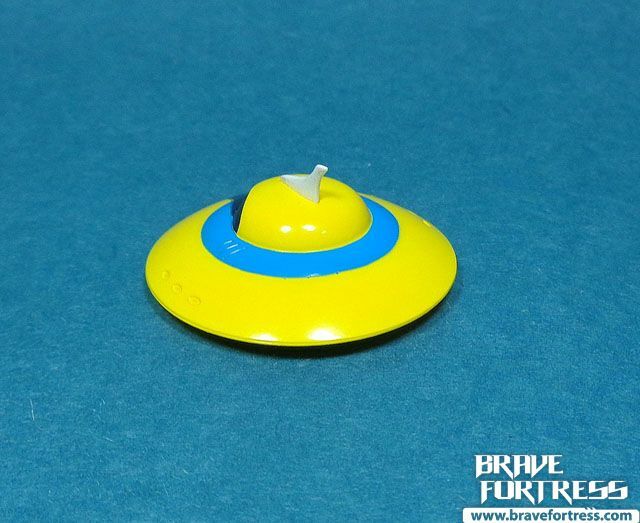 This is what the Double Spazer is supposed to look like in “parked” mode. 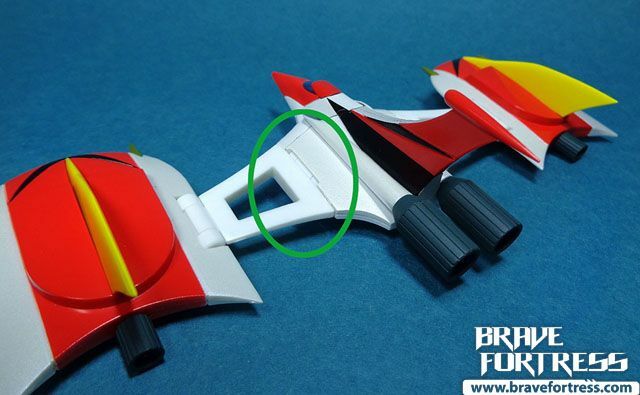 To get the wings to fold up or down, it is recommended you pull the wings to the side out first to give it some allowance to move, otherwise, there’s going to be some plastic on plastic friction. 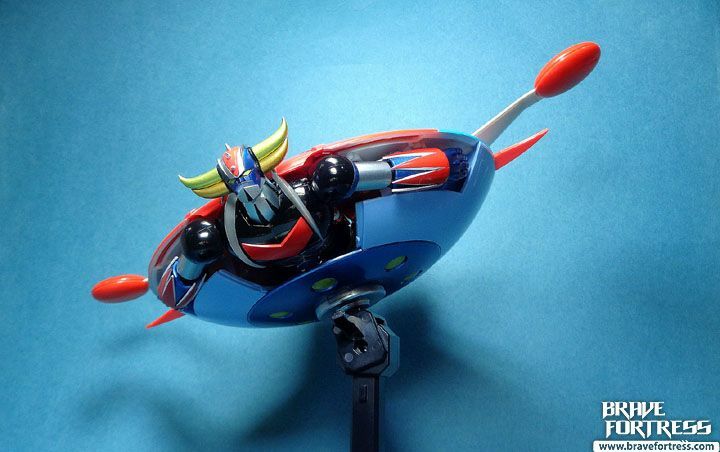 To enable the Double Spazer to attach to Grendizer you have to do some parts swapping. 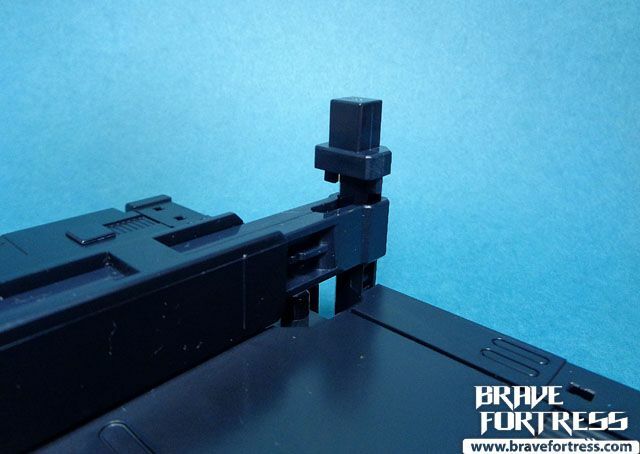 You will have to use the attachments to attach the Spazers into position. 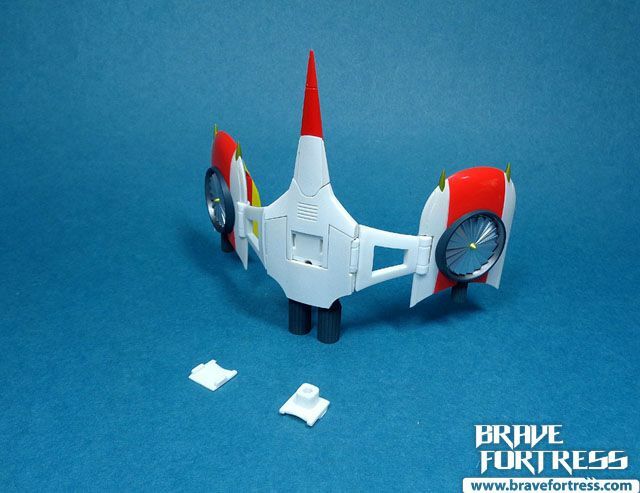 Likewise you will also have to swap out parts on the bottom of the Spazer to get it to peg onto the display base. 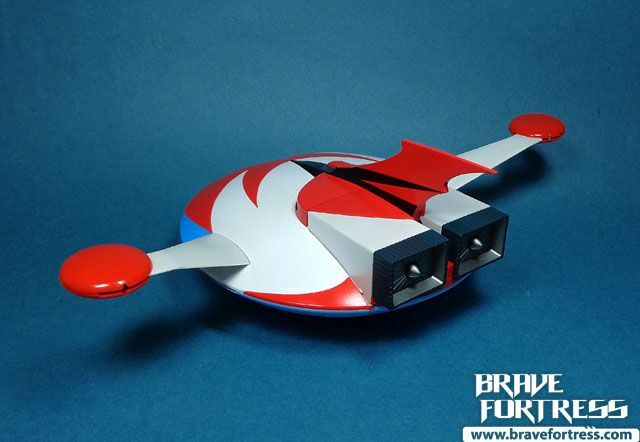 Sadly the TFO does not have its own attachment and has to share with same post with the Double Spazer, or you can opt to leave it sitting on the corner of the platform. 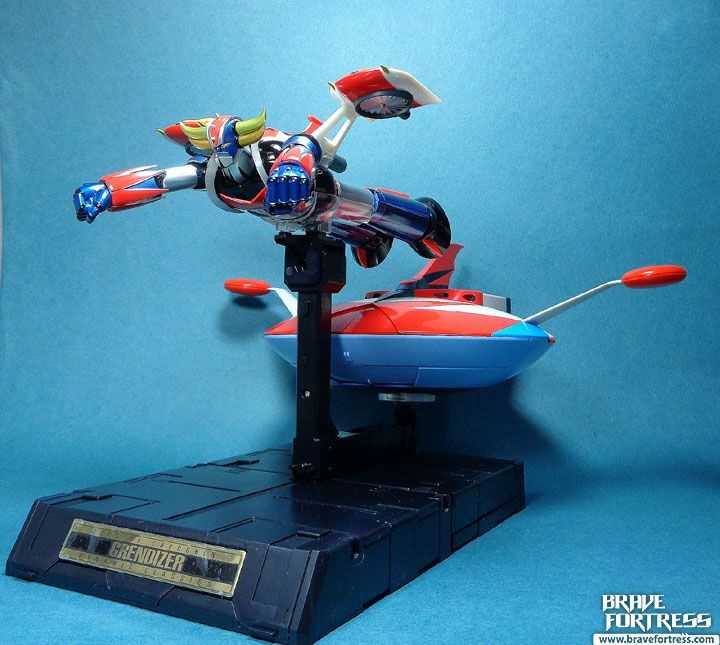 The display base combines with the Gx-76 display base. 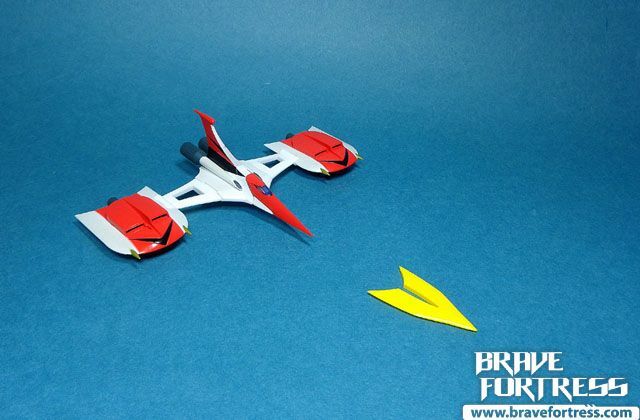 You will need this little block for the Spazer to “land” on. 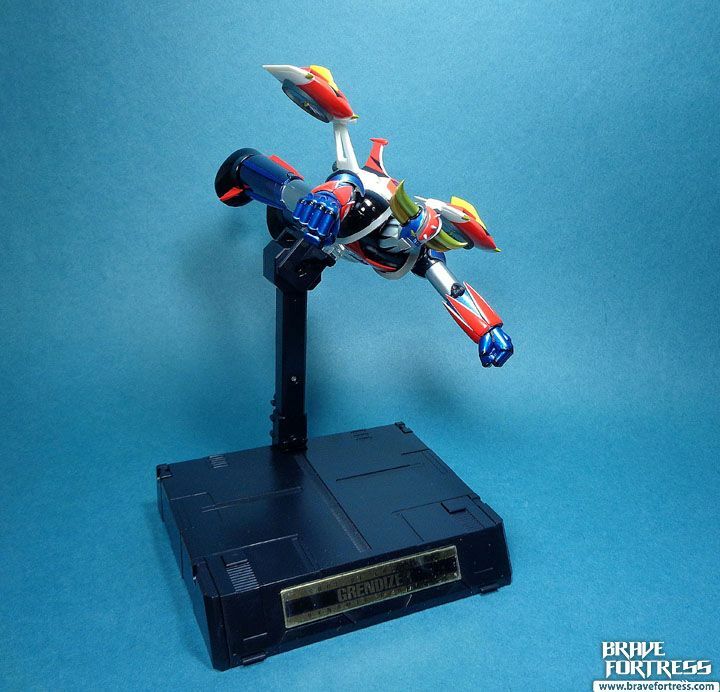 Alternately, if you’re short on space, you can use just the Gx-76 display base and attach the new arm stand on it for the Spazer. 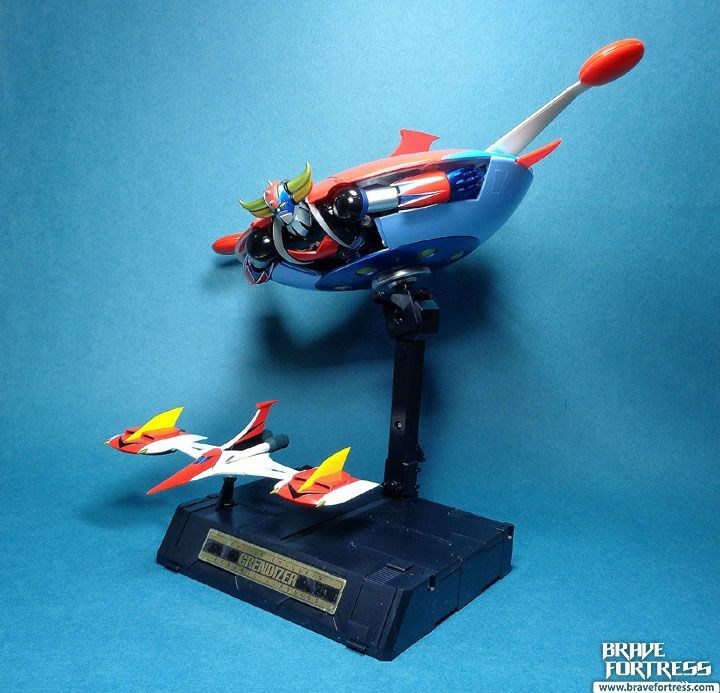 There’s a ratchet joint at the neck of the stand, so you can pose the Spazer flying at an angle. 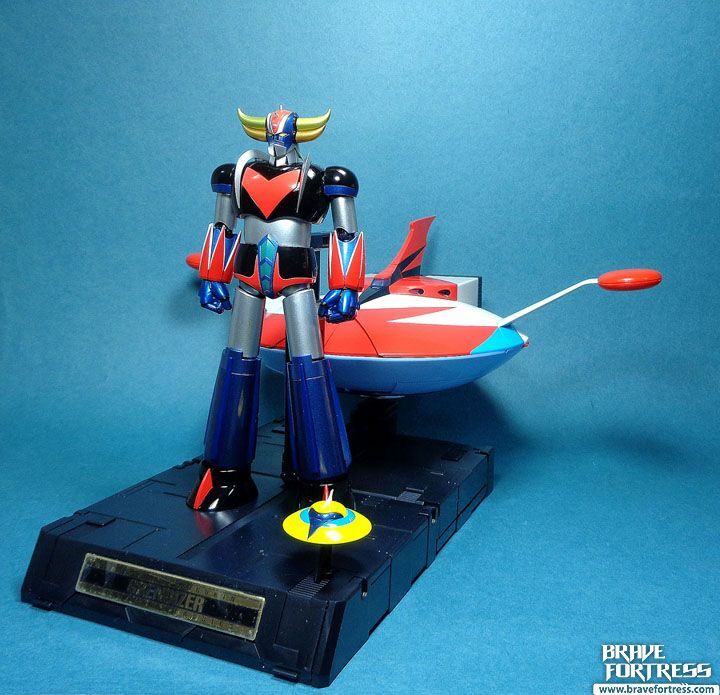 To pose Grendizer with the Double Spazer you will have to use the all clear torso cover to plug the figure onto the display base. 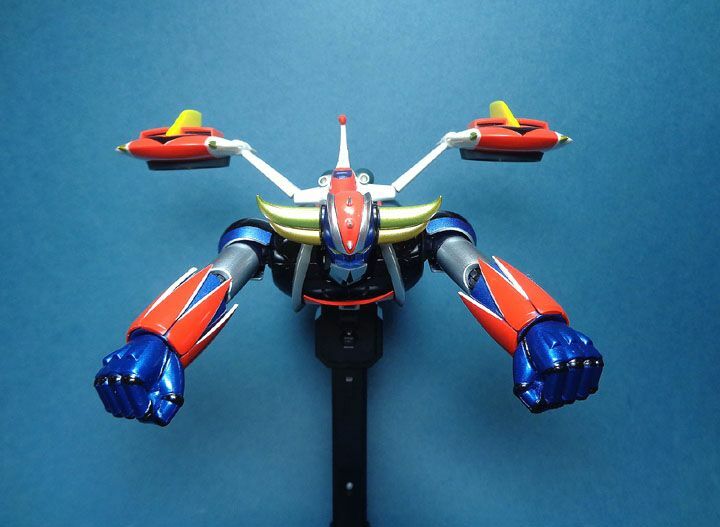 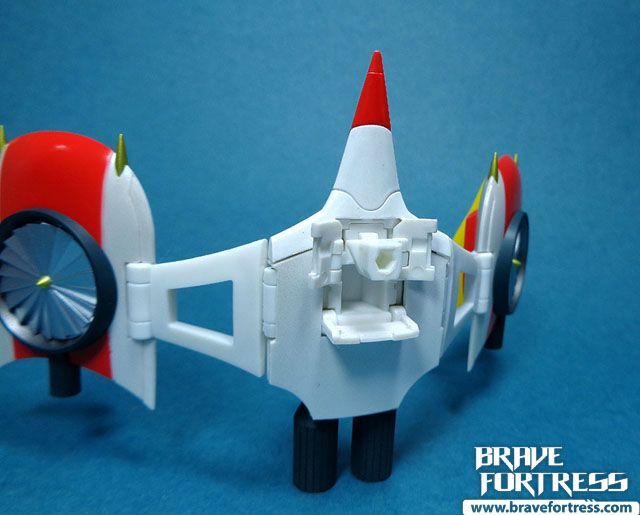 Using the same ratchet joint for the Spazer, you can pose Double Spazer Grendizer at an angled flight mode as well. 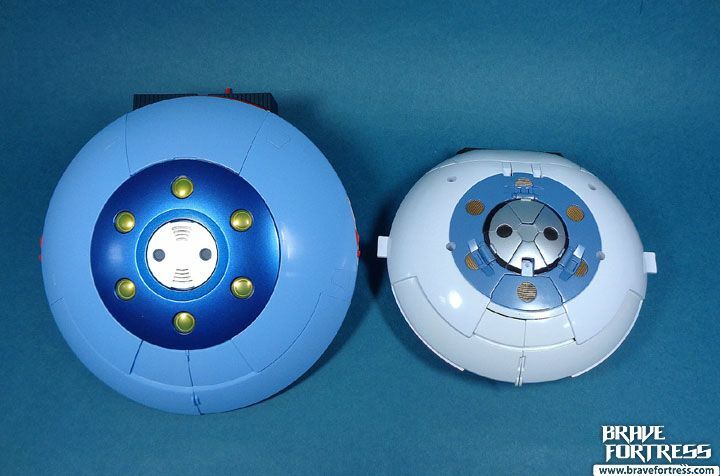 Comparison with the old Gx-04 versions. 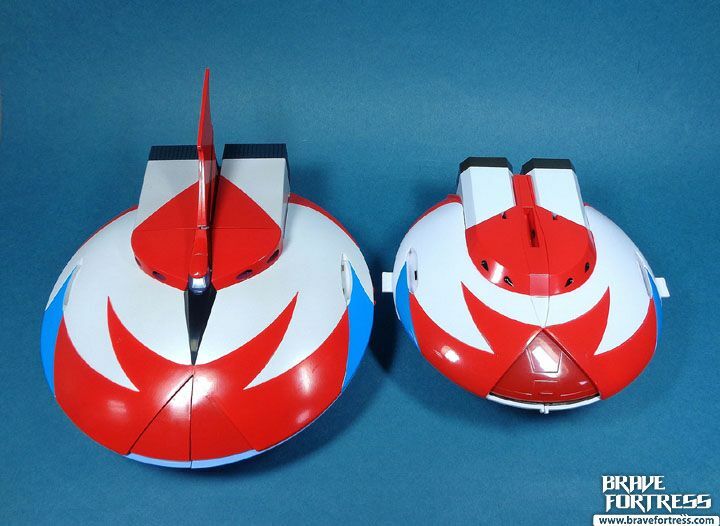 Gx-76 on the left. 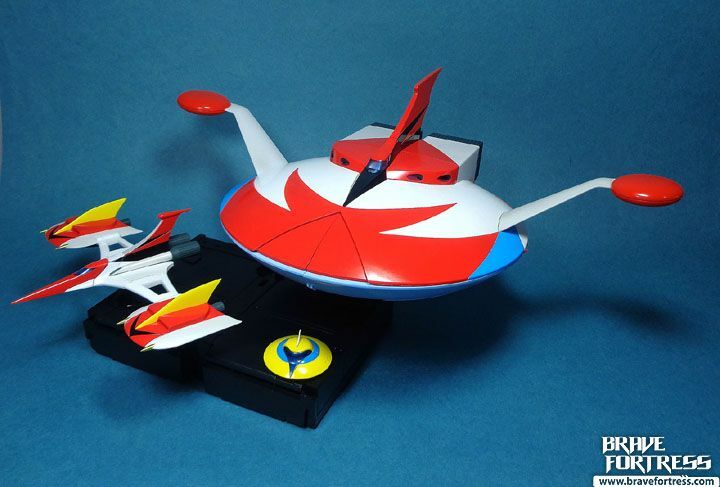 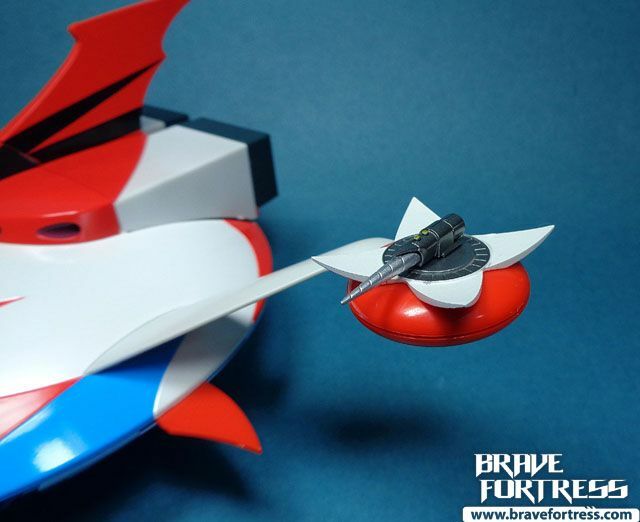 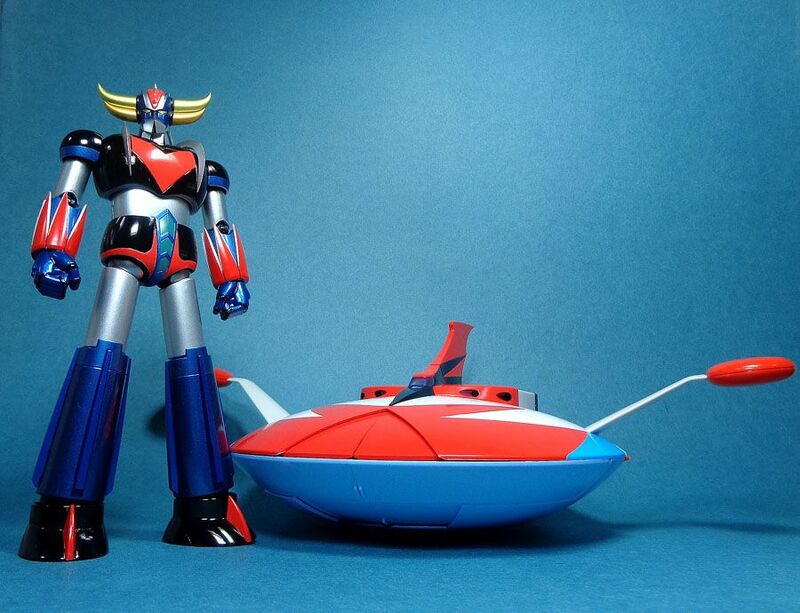 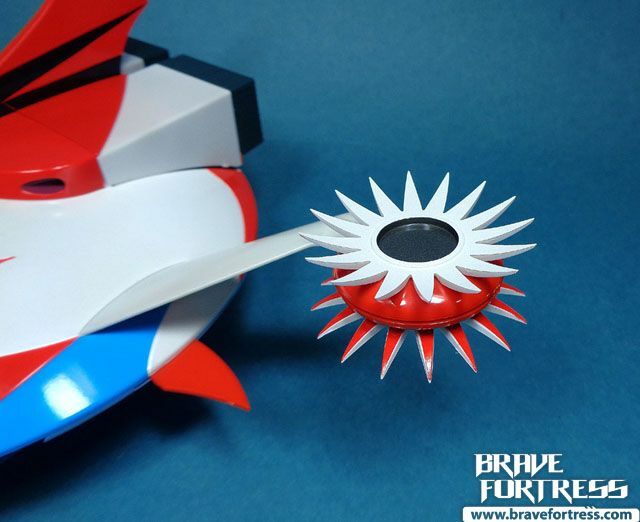 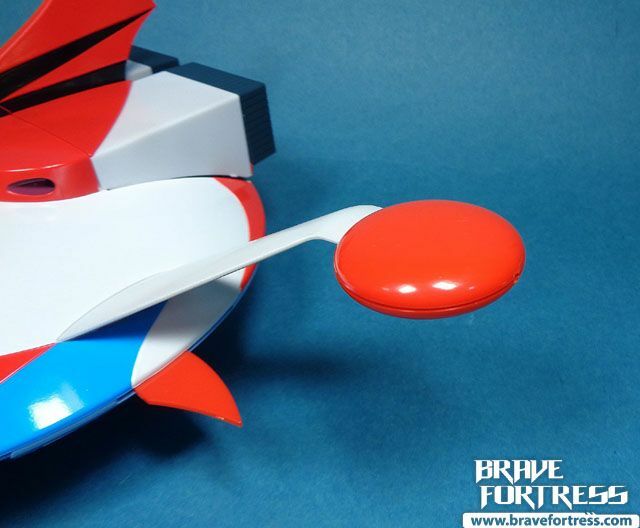 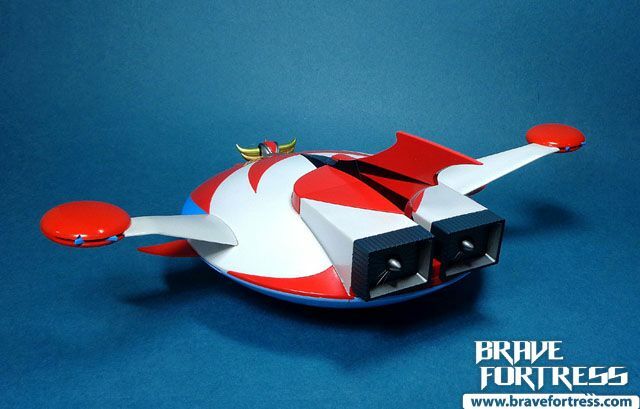 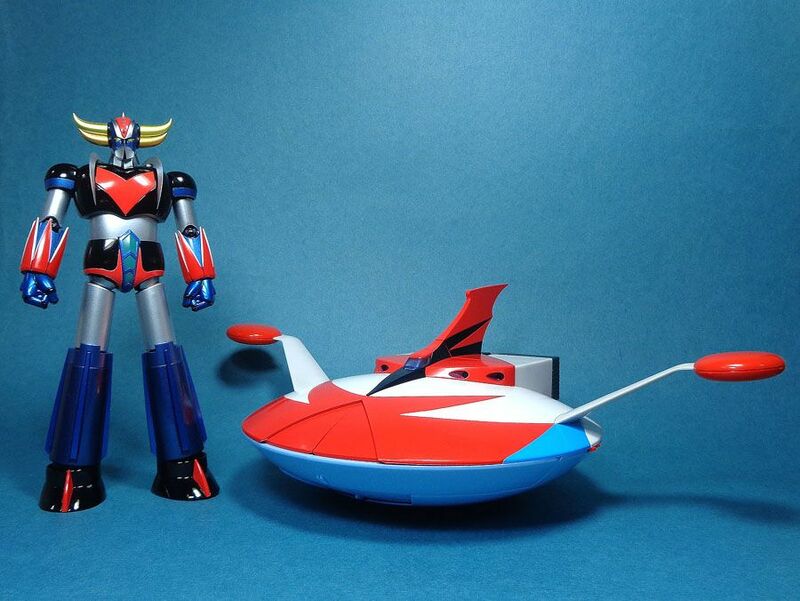 -Grendizer no longer needs to “shrink” its legs to fit into the saucer. 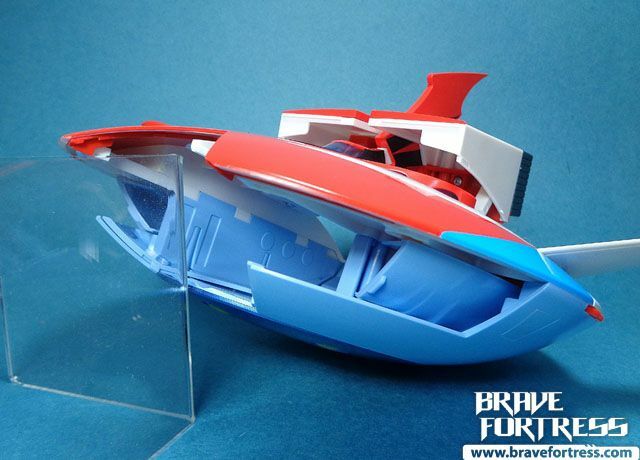 -Good engineering with regards to the opening hatches on the Spazer. 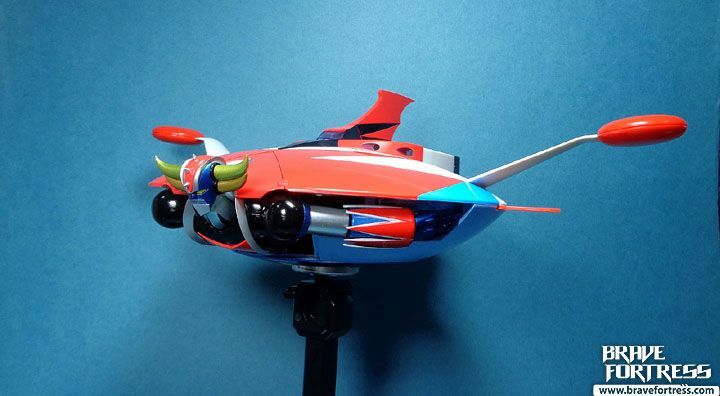 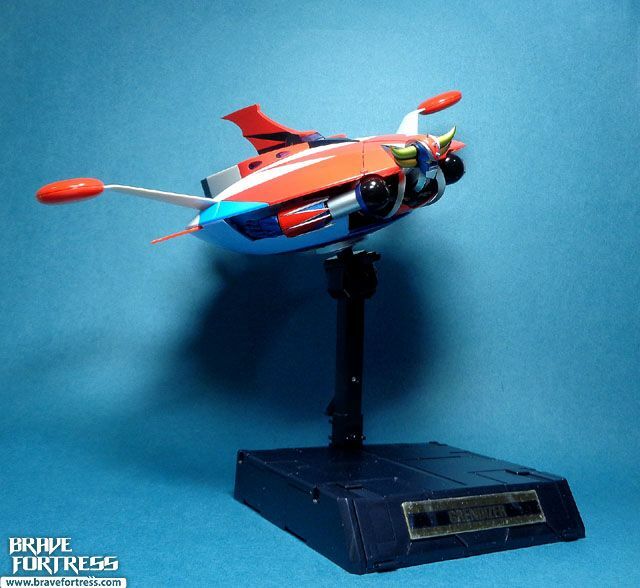 -“Rail” gimmick for a smooth Grendizer launch is clever. 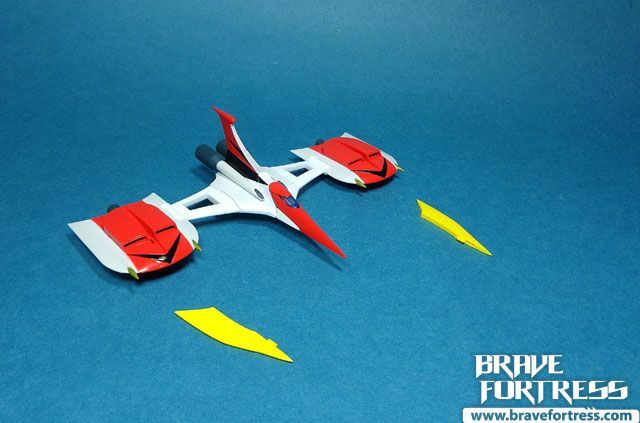 -Spazer weighs 291 grams and Double Spazer weighs 31 grams. 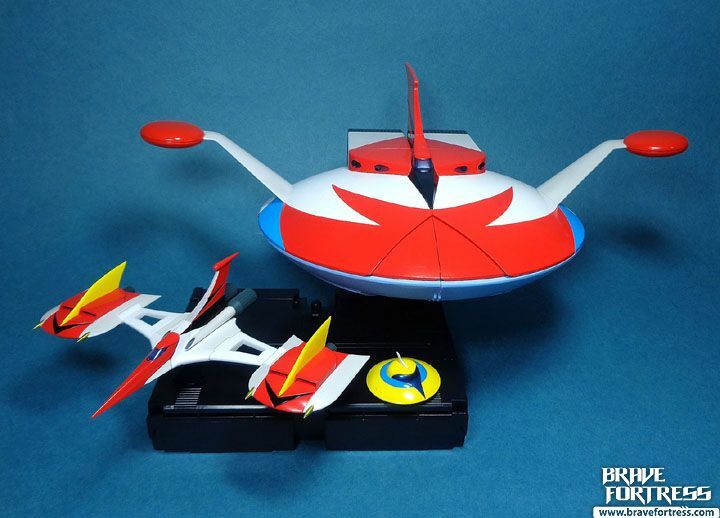 By comparison, the original Gx-04 Spazer weighs 193 grams and Double Spazer is 74 grams. 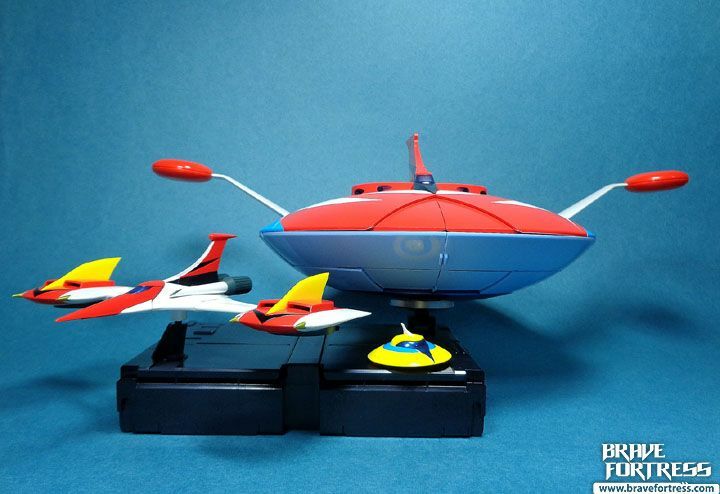 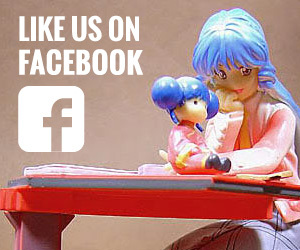 -The set is ENTIRELY PLASTIC. 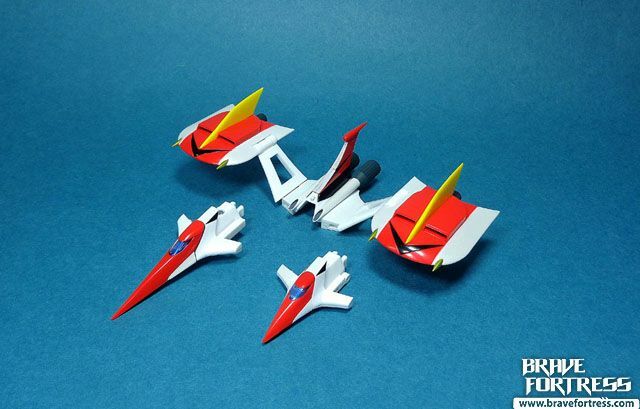 Zero diecast on any of the ships in this set. 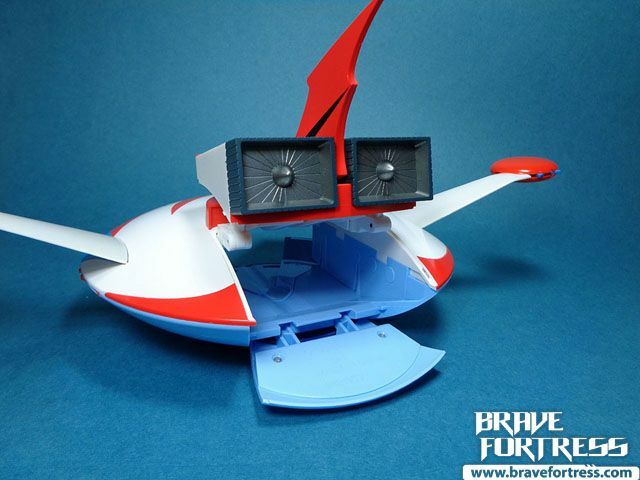 -I wish the TFO had opening hatches, or at the very least, a clear canopy. 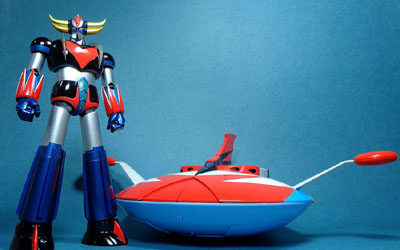 -Removing the torso cover for Grendizer is very hard if you don’t know what to do. 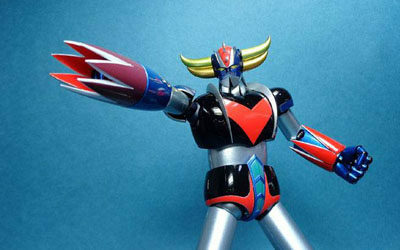 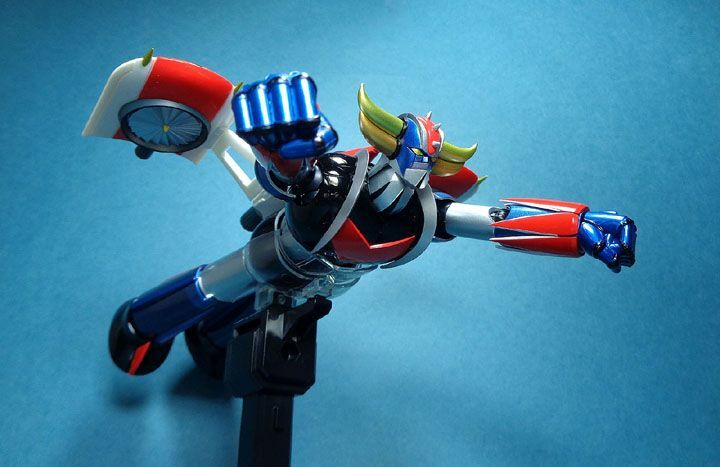 -Some parts swapping involved (to cover Grendizer’s back) when plugging in Grendizer into the Spazer. 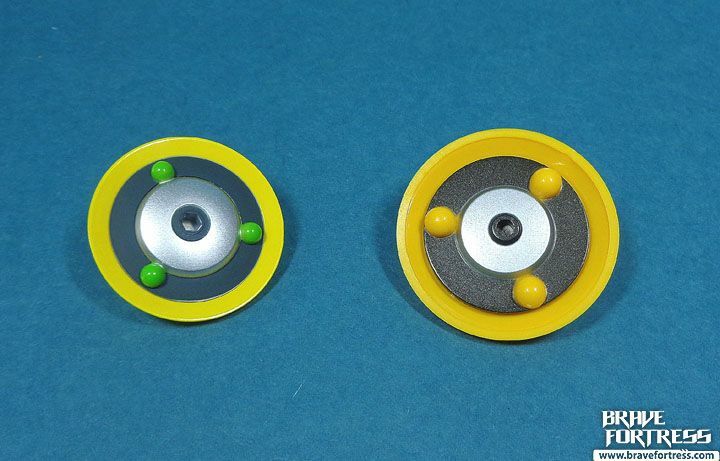 -Parts swapping for Double Spazer as well. 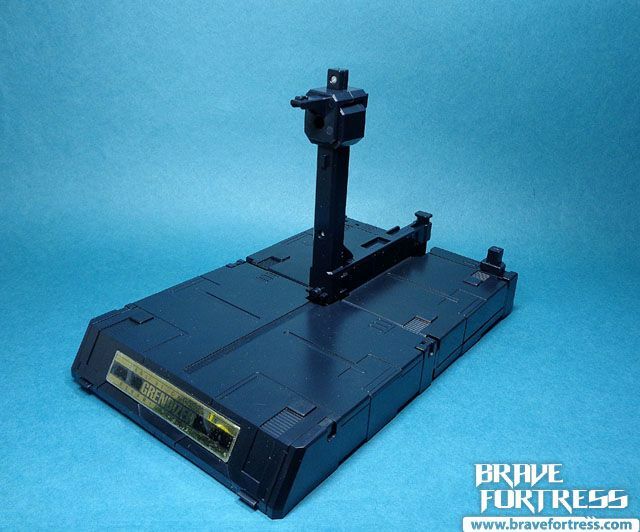 Lack of diecast. 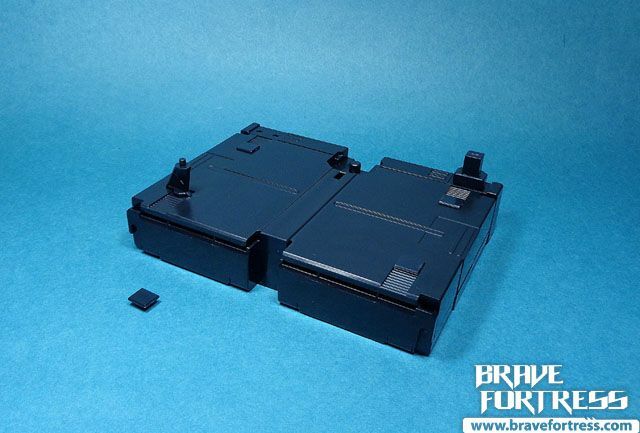 I know I already mentioned it but for a Soul of Chogokin release, I think this may be a first in the line, wherein nothing in the set has metal. 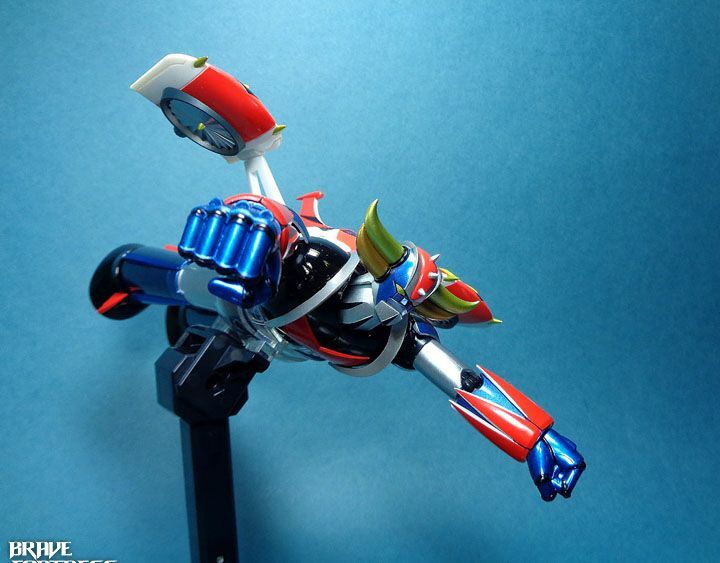 Overall, I’m not too crazy for it, in some ways it feels like a step back for the SOC line. 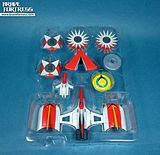 Considering this whole set consists of plastic parts when the older version had diecast, it seems wrong. 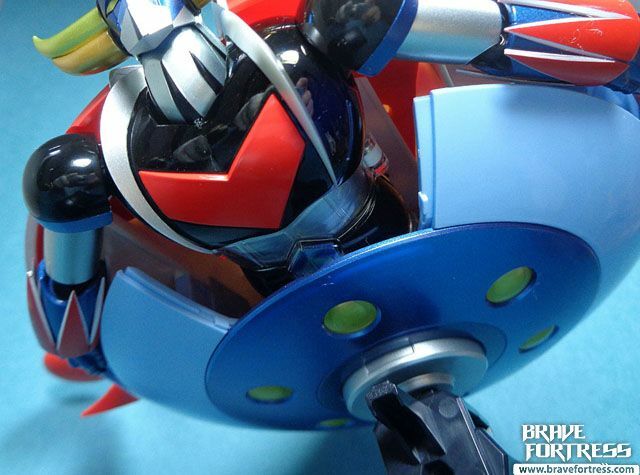 It wouldn’t be so bad if it meant the price was drastically lowered, but sadly, no. 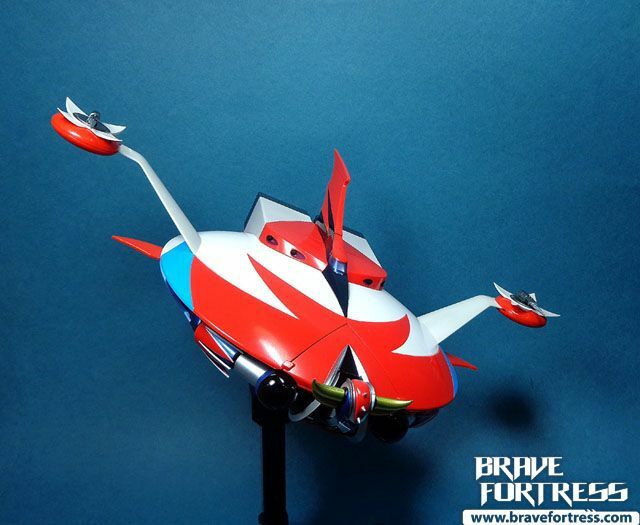 The good news is that sculpting is perfect and I think it captures the likeness of the vehicles in the show more than the original Gx-04 pieces. 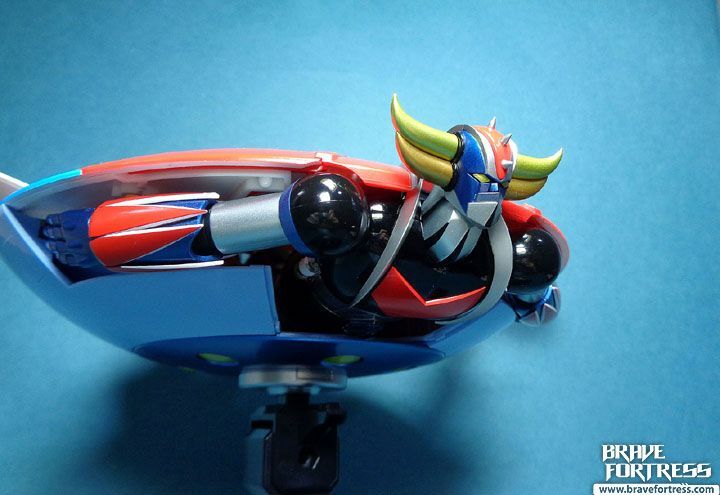 The engineering is good and I love the addition of the sliding gimmick to make it fun to launch Grendizer from the Spazer, but that too has some problems itself (namely removing the torso protector). 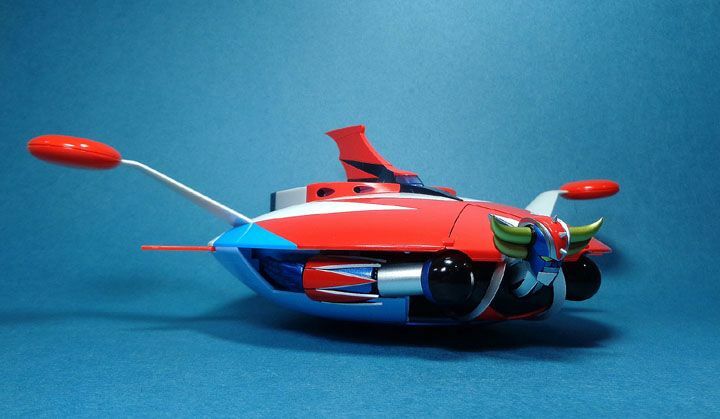 It’s hard to recommend a release when it doesn’t give you a decent bang for the buck, but I think it’s still a must have since Grendizer just feels incomplete without his Spazer.